Discussion in 'Colored Gemstones' started by mw_thomas, Jan 3, 2019. I have this .96ct radiant garnet that I want to set into a three stone ring. I have been thinking of using blue side stones, something almost paraiba coloured. Apatite would be the only stone within budget that I could think of, it is so soft though. Does anyone have any suggestions for stones? Or examples of this colour combo, I saw some similar colours in the VCA seven seas collection but nothing else. The garnet is slightly less saturated in real life, it’s a very bright and refreshing stone. What about electric blue topaz. Pretty inexpensive but still brightly colored. Yup, that's my vote as well! Hauyne would be my first choice to go with this shade of green. Hauyne are difficult to find, but there are some blue sapphires close to that shade of blue. I wouldn't go with paraiba/apatite, for no other reason than that I much prefer mint green with medium blues and turquoise blues with intense greens. My preferred green gem to go with paraiba-colored melee are the apple-green demantoids. i think zircon and topaz would work well, too, as those are medium blues as well, but I have trouble finding them melee-sized. Many of the ones available for sale are larger than I prefer, so I hope other PS'ers would be able to point you to vendors that have them. Good luck! I think your Merelani mint garnet is drool worthy gorgeous! leslie1956 and molecule like this. What about light colored Tanzanites? The ones that are not heated to that dark blue. The light bluish-purplish would be really pretty with the green. Plus they have a little sparkle too. Does it have to be blue?? Pink side stones would probably make the color pop more. No suggestions, just wanted to say love the garnet. Thanks for the input everyone, I am not a huge fan of blue topaz, I’m not sure what it is, I’ve just never been drawn to it. I love @voce suggestion. I think a vivid medium saturated blue would be a great colour to pair with this stone. Any suggestions on where to look? 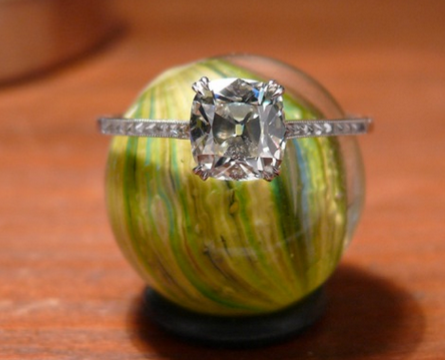 I would prefer a radiant cut, but a cushion, emerald or Asscher cut would also work. Pink was what I was originally thinking and I did order a pair of pastel pink spinel radiants to go with this, but I already have so many pink stones I want to go with something different for this ring. Does anyone have any examples of minty coloured stones paired with vivid blue stones? I would go with zircon if you want blue.